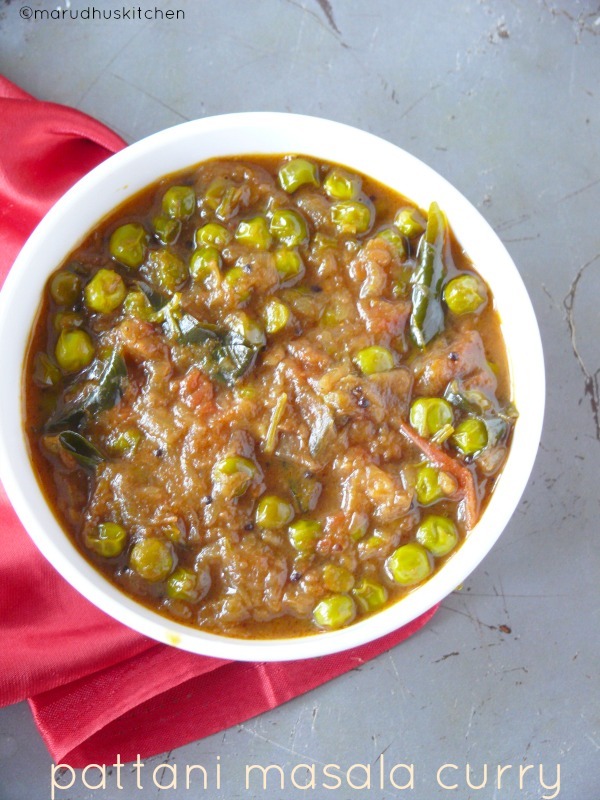 Green peas tastes best when it is in season with all its sweetish starchiness.In season when its available cheap it can be bought and frozen for future use for the whole year. It’s a very flexible vegetable that goes hand in hand with any veggie combination. It gives a final satisfying look and taste to any dish you make! it’s totally a relish. 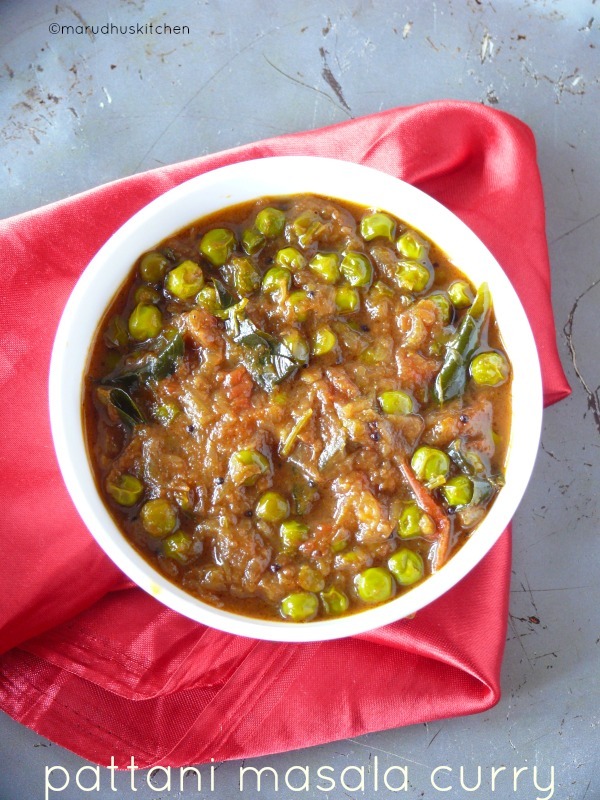 Green peas is a low-calorie veggie with loaded vitamin k and even folic acid.You can try my green peas soup here in my blog which is a different try but tasted good.Green peas makes excellent sabzi’s and this particular curry needs no coconut. pattani masala curry is a kind of simple gravy that can be done without any fuss.Instead of green peas we can use mushroom and do the same gravy it will be very nice. This pattani masala curry can be had with rice or chapathi,even it serves as an excellent side dish for simple curd rice. 2.Keep a kadai with oil and add mustard to splutter. 3.Then add onions with curry leaves. 4.When onions are brown add ginger garlic paste. 5.Saute nicely till rawness of the ginger garlic goes away. 6.Now add tomatoes and should become mushy and cooked,now add peas. 7.Saute for some time add turmeric and salt. 8.Add chilli powder and garam masala and stir well till rawness goes away. 9.Now add sufficient water for the gravy and for the vegetable to cook. You can keep the flame in sim and close the lid for 5 minutes so that oil oozes out. Keep a kadai with oil and add mustard to splutter. Then add onions with curry leaves. When onions are brown add ginger garlic paste. Saute nicely till rawness of the ginger garlic goes away. Now add tomatoes and should become mushy and cooked,now add peas. Saute for some time add turmeric and salt. Add chilli powder and garam masala and stir well till rawness goes away. Now add sufficient water for the gravy and for the vegetable to cook. I have used less tangy tomatoes you can use any as you wish. It will be apt side dish for chappathi and rice.